Thanks for visiting the CoilShot support section. Here you will find answers to the most common support questions our customers have. Utilize the tabs to find the appropriate selection for your needs. I turned the soap off, but soap still comes out. Is it broken? No. The dial on the side of the gun is to dial in your soap level. It ranges from a little bit of foaming cleaner to a lot of foaming cleaner. It is not a “turn off the soap” dial. Our tablets include advanced cleaning and effervescing agents that improve the cleaning performance. As such, they act like antacid tablets, that once activated with water, they keep making foaming soap. The tablets are designed to be used up completely in one use. How long does the tablet last for? The CoilShot original formula pre-measured coil cleaner tablet is designed to last for 8-12 minutes. The CoilShot-HD formula is designed to last 7 – 10 minutes. The time is also impacted by the foaming level you choose. The more foam you choose, the less time the tablet will last. Any tips on cleaning coils? We recommend thoroughly wetting the coils prior to turning the foam on. The CoilShot allows you to put the power of pressurized water right on the coil without damaging it, so simply spraying the coil with water first will dislodge much of the dirt. After thoroughly wetting the coil, turn the dial to the desired level of foaming action. Note that the more foam you apply, the quicker the tablet will dissolve. For most cleaning needs we recommend turning the dial only halfway for moderate foaming. Apply the foam until the tablet is completely expended. Will I clean a coil with a single tablet? The answer to this question depends on the size of the coil and how dirty the coil is. In general, you can clean a 3-ton condenser with moderately dirty single-pass coils with one tablet. Dirtier condensers or larger units will require more than one tablet. Results will vary. Can the CoilShot clean any size condenser? The CoilShot is designed for cleaning smaller residential and light commercial condensers with single pass coils. This is generally in the 3-5 ton range, however coils and condensers come in multiple configurations so cleaning results will vary depending on coils thickness, the level of dirt and other factors. Can I use this on double pass coils? The CoilShot is designed for use on single pass coils. Our testing identifies that double pass coils are just too thick to clean all the way through. Make sure the garden hose is connected and water is turned on and flows freely from the hose. Trigger is damaged and will not activate. 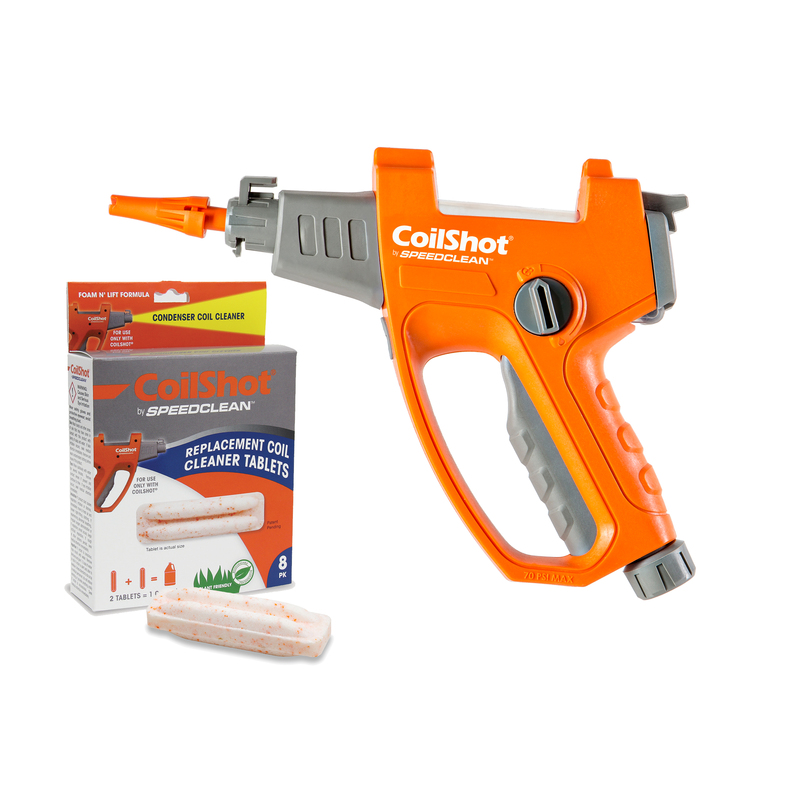 The CoilShot includes safety features that allow built up pressure to vent out through the nozzle. If a CoilShot tablet has not been completely expended, it may cause some foam to continue to make it’s way to the nozzle chamber. We recommend turning the valve to full soap until the tablet is expended fully. O-ring in the door is broken or missing and needs to be replaced. Latch is broken or worn. The O-ring in the tip of the gun is broken and should be replaced. The trigger valve O-ring is damaged. The quick disconnect is worn and needs to be replaced. The chemical valve is closed and needs to be opened. The tablet has dissolved completely and needs to be replaced. The hose connector is out of round. The water seal is damaged. Threads are stripped on the plastic connector. This unit has been carefully tested and inspected at the factory and is warranted to be free from defects in material or workmanship. The company will, under this warranty, repair or replace any parts which prove, upon examination, to be defective. This warranty is valid 90 days from date of purchase by original purchaser. This warranty excludes accessories, unusual wear, abuse, damage resulting from accident, or unreasonable use of this machine. It is recommended that any repair be done by SpeedClean as improperly performed repairs will void the warranty. For repairs or warranty information DO NOT contact the place of purchase. Call SpeedClean directly at the phone number on the cover page. This warranty gives you specific legal rights and you may have other rights which vary from state to state. To obtain warranty service, a proof of purchase is required and the unit must be returned freight prepaid. For repair or warranty information, contact SpeedClean Customer Service.